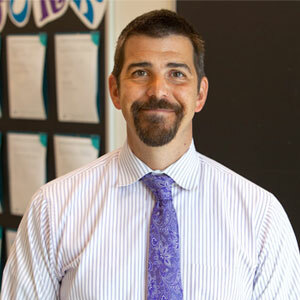 Prior to joining the Meeting Street Schools team in 2014, Dirk served as principal of Westside Middle School in Tennessee’s Achievement School District (ASD), a statewide turnaround district. While in the ASD, Dirk was selected as a founding member of Relay Graduate School’s National Principal Academy Fellowship. Under Dirk’s leadership, Westside Middle earned Level 5 growth, the highest possible rating in Tennessee. Before joining the ASD, Dirk served as the principal of Mitchell Math and Science Elementary School in the Charleston County School District (CCSD). At Mitchell, Dirk and his team not only saw incredible growth in student proficiency rates – from 15% to 60% in ELA and from 17% to 66% in math – but they also earned the highest parent satisfaction rates among all 80 schools in the CCSD. A native Georgian turned Charlestonian, Dirk moved to Charleston after graduating from the University of Notre Dame. He began his teaching career as a founding member of Americorps serving as a middle school teacher at The Charleston Catholic School, where he had the opportunity to do everything from teach Algebra and Latin to starting a concert band program to serving as Assistant Principal. When not at MSA, Dirk can be found in gyms across Charleston cheering on his daughter’s volleyball teams, shooting hoops in the driveway with his son, or walking his dogs with his wife to nearby Sharks Tooth Beach.